As with most children, what I wanted to be when I grew up changed a few times when I was younger. I wanted to be a vet. Then I found out about the seven years of studying. I was told stories of having to put down animals that couldn't be saved. So I decided that veterinary medicine wasn't for me. I wanted to be a singer. Then I found out that not everyone made it that tried. It was pointed out to me that I would also be permanently in the public eye if I did make it. So that wasn't for me either. There are two things that always remained constant throughout the years though. Firstly, I wanted to be a wife. I met my first goal on Saturday 14th May 2011 at 20 years of age. I married the love of my life in a beautiful ceremony surround by the love of family and friends. Secondly, I wanted to be a mother. We had our first daughter on 25th February 2014, and our second daughter on 15th December 2016 (I am also mummy to two angels). So I have met my second goal. Now that my two main goals in life are complete, I do not have much that I wish for. All I try to do now is be the best wife I can be; raise happy, healthy, and loved children; and keep some semblance of an orderly home and life. As much as you can with a tornado toddler running around anyway. I love my life, and I would not change it for the world. 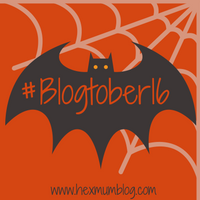 For more posts from Blogtober, visit the Blogtober category page. If you have any ideas for upcoming content or things you would like to see on my blog, feel free to share in the comments section below. Today for Blogtober 2018 I'm sharing some of my favourite blogs and bloggers that inspire me. If you haven't noticed, I absolutely love Christmas, and have been preparing for ages. Have you? Today I'm sharing some of my favourite craft ideas for Bonfire Night which is just around the corner. Today I'm sharing my wishes for the future, for my family and me. Read on to find a few of my favourite animals from my cousin’s collection of exotic pets. Today I’m going to share ten quick facts about me, to help you get to know me better! Here you'll find a couple of my favourite sweet treats, plus my favourite savoury recipe too! Although Christmas will always be my favourite, here are a few reasons I'm loving the autumn months. Here are a few reasons why I think some of the ladies in my life are truly inspirational. I'm sharing my mental health battles in the hope my story encourages others to get the help needed. I am a twenty eight year old wife and mama, blogging about the true realities of parenthood and marriage. From pregnancy to travelling with children to mental health battles, I’m not afraid to share it all. Being a mama to our two girls, a house wife, a blogger, a freelance writer and business owner is not easy at times, and requires a lot of discipline and patience. I can never find enough hours in the day but I wouldn't change a thing. I hope that as you read my posts, and as I share the raw, honest truth of good and bad times; you can garner a little comfort, and know you are not alone. Copyright © 2019, Me Becoming Mum. All rights reserved.